Find out how to achieve this exalted state in and throughout your most cherished relationships, and make your most heart-felt dreams a living reality. DIVINE ROMANCE & PERFECT PARTNERSHIP ~ The Immortal Principles & Powers of Divine Love! Discover the exquisite qualities that exist in relationships, exalted in the Highest Principles of Divine Love! Learn how to make these treasured values your very own! Bless all your relationships now and those to come… and forever more! Below, please find further descriptions, your free Preview and 5-Star Reviews. 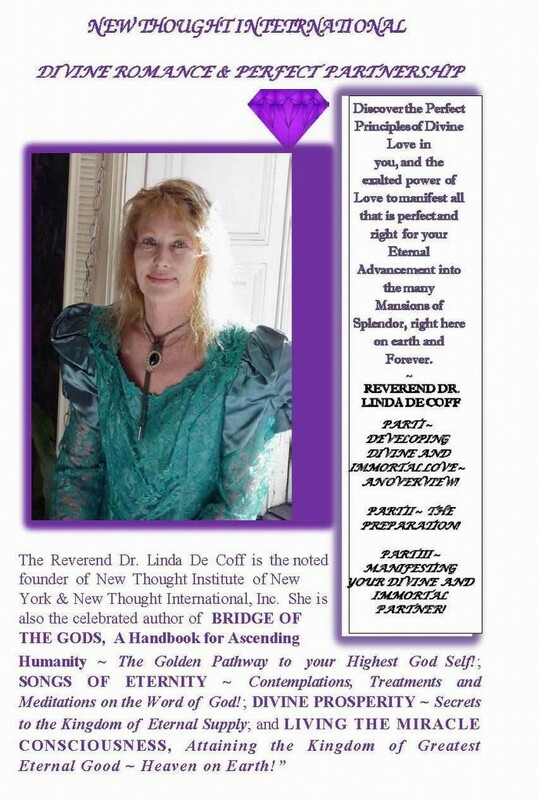 “Divine Romance & Perfect Partnership ~The Immortal Principles and Powers of Divine Love,” the next installment in Reverend Dr. Linda De Coff’s fabulous Global Divine Consciousness Series, proves once and for all Love is not an accident or a privilege, but the destiny of each and every one of us! This book is a master work of wisdom and understanding. Dr. Linda has helped us immensely in clearing the way for a Perfect Partner . By internalizing Dr. Linda’s ideas and approach, we can realize our dreams~ not only in partnership, but all other areas of life: the perfect home, perfect job, perfect life’s work. The principles are simple, but results are revolutionary! We are motivated on our personal path of integrity and success ~ to change our lives in numerous ways. Reading her book fosters illumination; it’s a blueprint and guide, with exercises, to assist you in reaching your Life’s Goals. Love unconditionally and ultimately achieve all you hold in mind. The author speaks sublime truth when she says the closer we get to ourselves, the closer we get to our true love. And of course this realignment of our conscience takes place within, something that we have control over. If we do the work and keep centered, Dr. Linda assures us that Principle will majestically bear fruit. It is the Law of the Universe. Do we have more than one Soul Mate? Are Souls threaded together? 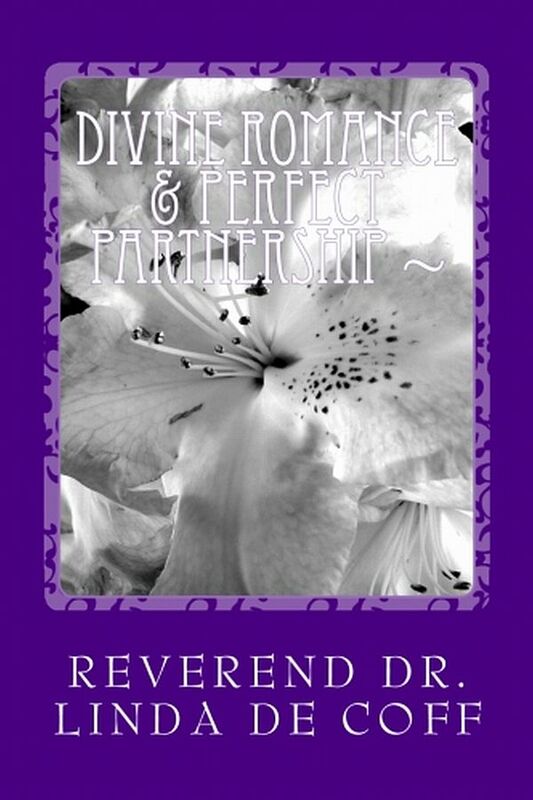 The beautifully written Divine Romance & Perfect Partnership by author Reverend Dr. Linda De Coff answers these questions and more. Humanity yearns for love. The path to a rich lasting relationship is learning to love oneself. As Dr Linda shares, loving the self attracts a deeper kind of love, which resonates with another soul on the same level. When the two souls come together it makes for an exciting relationship into the journey of evolution. Which do we choose, a frivolous relationship or one based in benevolent love? Inspired and Inspiring, “Divine Romance & Perfect Partnership: The Immortal Principles and Powers of Divine Love!” is very highly recommended reading, especially for those seeking to create, maintain, and enjoy relationships that will last a lifetime — and beyond! It should be noted for personal reading lists that “Divine Romance & Perfect Partnership” is also available in a Kindle edition ($9.99). In this stunning book on the incomparable powers and joys of Divine Romance & Perfect Partnership, Dr. Linda offers enlightening keys on how to prepare for, recognize and attract your perfect eternal mate ~ and how to sustain your relationship forever. Whether individual or couple, learn not only how to constantly renew all your relationships spanning the wide circumference of your life, but to lift all in your world to the Highest level, and experience greater fulfillment, bliss and attainment than ever before. Discover the Sublime Qualities that Exist and Flow between Partners, whose Relationships are Exalted, Harmonized and Perfected in Divine Purpose and Love. Learn how to make these treasured values your very own. Reverend Linda speaks about the Dynamics of Immortal Love and the Heavenly Possibilities always available to us in all our relationships, spanning all areas of life ~ With Particular Emphasis on Soul-Mates and the Exquisite Cosmic Potential of Right Now Fulfillment in Your Life ! As we release old, worn-out forms and move into a Spiritualization of Relationships of All Kinds, we are newly empowered and blessed. Rejoice in the Perfect Principles of Divine Love in you, and the exalted power of Love to manifest all that is perfect and right for your Eternal Advancement into the many Mansions of Splendor, right here on earth and Forever. PART I ~ DEVELOPING DIVINE AND IMMORTAL LOVE ~ AN OVERVIEW! PART II ~ THE PREPARATION! PART III ~ MANIFESTING YOUR DIVINE AND IMMORTAL PARTNER! The whole Universe is engaged in a Cosmic Romance. You and your beloved have existed throughout eternity in the Heart of God, for God ever creates perfect compliments in all. Like travelers venturing forth throughout space and time to acquire experience ~ your Divine partner and you have followed your individual paths… yet, ever remained in constant awareness and Soul connection to each other. As your Souls evolve, now, to embrace Higher Stages of Love ~ you become mighty magnets, ready to embrace one another in strength and power, once again; and to share the bounty of all the good, you have become, throughout your many sojourns. The Universe rejoices. Now, as you prepare to receive, you are brought together in perfect harmony, Higher Purpose and bliss. God’s Love is richly fulfilled through you. AND THE LOVE THAT IS! IN BODY, MIND, AND BEING. RESPLENDENT AND GLORIOUS… LOVE SHOWN BRIGHT. WE ARE DRAWN TOGETHER NOW. OF INFINITE TIME AND SPACE. NOW…UNITED UNDER LOVE’S PERFECTING EMBRACE. OH, OUR TIMING IS EVER SO PERFECT AND DIVINE! THOU DOST EVER SUPPLY ME IN ALL. THE PERFECT FULFILLMENT OF EACH OTHER. To hear recent radio interviews, and/or to read ongoing articles on Higher Consciousness themes, visit https://www.revdrlindadecoff.com (see media and archive sections).